From "Diving into the Wreck"
You need to get to the rain forests before they're all gone, and the polar ice caps may have melted by the time you try to see them, but it's Alabama that demands your immediate attention. And by Alabama I mean that place where elegant black ladies of a certain age stand sentinel over the trails through civil rights country. Really. They're lit from within, these women; they glow as only people can who never thought they'd live to see the day but then live to see the day. And as they gaze out on the landscape of a country facing agonizing choices and certain pain, they haven't a doubt in the world that we'll get through this. After all, we've gotten through far worse. Before coming to the institute, Williams spent all of 31 years teaching fourth grade in Birmingham public schools. And still she retired too soon. "We used to have that poster with all the presidents, you know?" Williams says. "And I distinctly remember this little boy coming up to me one day and saying, 'Mrs. Williams, where is the black one?' I thought, Lord, give the words to say it." She stops for a moment, collects herself. "I just said to him, 'Maybe in your lifetime.' "
Today I am 47, and I have a feeling that this is going to be a very good year. I found this essay by Andrew Koppelman interesting. He is reviewing a book by a Catholic philosopher who thinks that, deep down, it is not possible to care about human rights without believing in god. Koppelman's answer is that whatever the results of philosophy, it simply is possible to be an agnostic worker for human rights. Perhaps agnostics have no defensible basis for their belief that people should be free and fed, but then nobody has a defensible reason for belief in god, either. To Koppelman (and to me) all moral systems have components of invention and faith. Religion solves no moral problems, it just changes the problem from "why do you care about other people?" to "why do you believe in god and how do you know what he wants?" Wherever you situate yourself in this landscape, your view of the moral universe won’t—and can’t be—a neat, closed system with all the loose ends tidied up. Recognizing this can inoculate us against two related errors: One is to think that we have all the answers. The other, perhaps even more malign, is to be too confident of what the other fellow’s beliefs entail: that his or her “belief in God produces fanaticism” or “atheism leads to immorality.” . . . We’re all stumbling around in the dark, grabbing as much of the elephant as we can. It is unseemly to mock one another’s shortsightedness. Taylor’s book does a wonderful job of elucidating the predicament that is, at the deepest level, what unites us. For about ten years now I have been reading books about animals to small children: tigers, leopards, monkeys, sharks, snakes, komodo dragons. Almost every one of these books has a final chapter bemoaning the threat humans pose the animals we have been reading about. This drives me crazy. What is gained by making five-year-olds feel bad about tiger poaching? Why would I want to send my children to bed in a state of anxiety about orangutan extinction? It seems to me that what we want is to give children positive feelings about wild animals, so that when they learn, at a more appropriate age, about deforestation, they will care about the fate of wild things. Last night I read Ben a book about coyotes. You might think that since coyotes have enormously expanded their range and numbers over the past 400 years, this book might end on a more positive note. But no: "although coyotes are doing well now, we don't know what the future holds for them in a world with ever more people...." Maybe I should try a book about rats. This bad feeling for its own sake is the dark side of environmentalism. The message these books are sending is that all joy ought to be tinged with worry -- whenever we take delight in the power of tigers and the cunning of coyotes, we ought also to fret about the fate of the planet. But this is crazy. I see no evidence that making people feel bad is a good way to motivate changes in behavior. On the contrary, everything I know tells me that people will contribute to causes that make them feel good, and that unending negativity only turns people away. So whenever there is a chance to tout conservation measures that work, or to point out the many creatures that are still thriving in the world, we ought to be doing that instead of broadcasting gloom. Especially in books for five-year-olds. 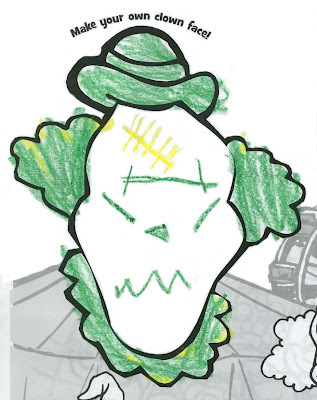 Ben (6) doodled this in his kid's menu Monday evening. 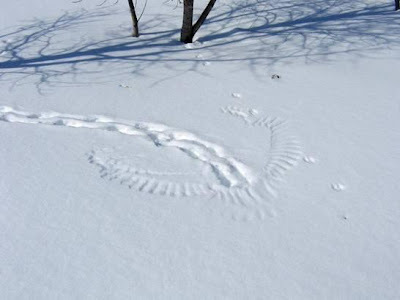 Can you read this clue and figure out what happened here? The answer is in the comments. Do We Fear our Enemies More than We Love Our Children? 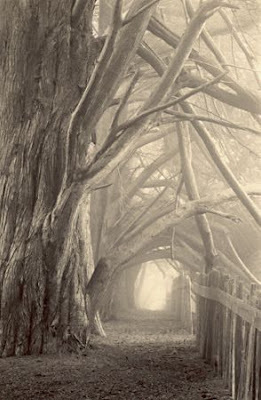 A wonderful photographer with many dreamy tree scenes like this one, which looks to me like an invitation to an adventure. I find that one of life's great small joys is waking up in the dark with a grim feeling that it is time to get up even though I don't want to, checking the clock, seeing that I still have hours before the alarm will go off, and then drifting happily back to sleep. 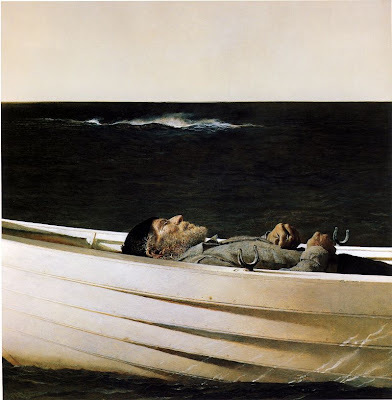 Thanks to Lisa Krauss, this is the Andrew Wyeth painting I was trying to find. 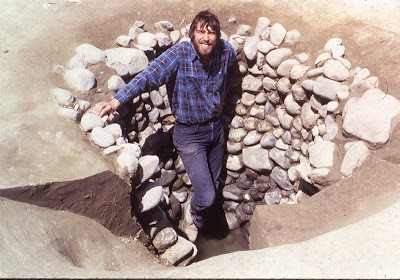 I just stumbled across this picture of me in 1985, standing in the well of a small plantation dating to about 1650. 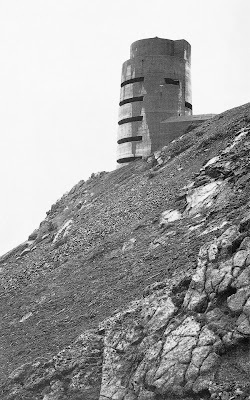 Some of Paul Virilio's photographs of WW II bunkers along the French coast have been posted at The Morning News. I find them quite striking in a grim way, because they seem to refer both to recent, terrible events and to archaeological photos of ancient castles and temples. The report by the National Academy of Sciences is to be released this month. People who have seen it say it is a sweeping critique of many forensic methods that the police and prosecutors rely on, including fingerprinting, firearms identification and analysis of bite marks, blood spatter, hair and handwriting. The report says such analyses are often handled by poorly trained technicians who then exaggerate the accuracy of their methods in court. It concludes that Congress should create a federal agency to guarantee the independence of the field, which has been dominated by law enforcement agencies, say forensic professionals, scholars and scientists who have seen review copies of the study. We send people to prison for life in this country using "scientific" evidence that couldn't get published in the lowest tier of scientific journals. The people who control the forensic labs, starting with the FBI, have always refused to allow outside testing of their labs, which as far as I am concerned renders all of their results useless. As things stand now we simply have no way of knowing how accurate these labs are. Academic investigators who have done small studies have found frightening error rates of greater than 20% for finger-print analysis, to take just one example. The first thing we should do is require all forensic labs to submit to annual checks of their accuracy by an outside regulatory body. The accuracy of their results-- say, that they matched 96 out of 100 DNA samples accurately-- should then be published and made available to judges and juries. We don't test crime labs because it would be expensive and because it might make it harder to get convictions. But getting convictions isn't the point of the justice system, getting the truth is. And while getting at the truth is hard is most areas of life, it is fairly straightforward in science. It would not be hard to answer questions like "how accurate is the FBI fingerprinting lab?" if we simply did the necessary tests. That we don't is a travesty. When I was about 12, I guess, I noticed that every time I saw a "No Dumping" sign there was trash strewn all around it. I wondered, do people with trash to dump wander around looking for a "No Dumping" sign? When they find one do they think, "Aha, this is the spot?" I pondered this on occasion for two or three years before one day it finally hit me: nobody would bother to put up a "No Dumping" sign except in a place where people had been dumping trash. I had an experience on the train today that I have had three or four times. I sat with two bureaucrats who used to work in the same office but are now in different buildings although still in the same agency. They spent the whole 40-minute train ride catching up. They talked mostly about work, for forty minutes, and when we reached our station I still had no idea what either one does or what agency they work for. They talked about "changes" happening with the new political appointees, but I got no idea what those changes were. They talked about retirements and other departures. One said, "I heard you fired someone; was that difficult?" and the other explained for a few minutes how difficult it was. (Lawyers were involved.) They discussed how the old Inspector General, a political appointee, had now come back as the Deputy IG, a civil service post. They talked about the budget process; one heads a group that used to have two people work on the budget part time now but said it now takes four people full time. And so on and so on, forty minutes of shop talk. And in all of it I picked up only a single clue to where they work, that their agency has a hot line that gets thousands of calls. The wheels of bureaucracy grind on, pretty much irrespective of what part of the government you're talking about. About as wide as a human pinky nail when fully grown, the immortal jellyfish (scientific name: Turritopsis dohrnii) was discovered in the Mediterranean Sea in 1883. But its unique ability was not discovered until the 1990s. But when starvation, physical damage, or other crises arise, "instead of sure death, [Turritopsis] transforms all of its existing cells into a younger state," said study author Maria Pia Miglietta, a researcher at Pennsylvania State University. The jellyfish turns itself into a bloblike cyst, which then develops into a polyp colony, essentially the first stage in jellyfish life. 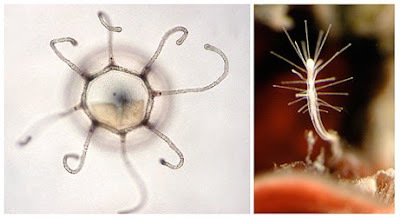 Through asexual reproduction, the resulting polyp colony can spawn hundreds of genetically identical jellyfish—near perfect copies of the original adult. From Wilfred McClay, an interesting article on Abraham Lincoln and on how different history seems to those living through it than it does looking backward. As McClay says, Lincoln is now regarded as a great man, but at the time he was hugely controversial and widely hated. We need to remember that this is often how history happens. Background music does not swell at the crucial moment, and trumpets do not sound, when the events of history are actually taking place. The orator or the soldier has to wonder whether he is acting in vain, whether the criticisms of others are in fact warranted, whether time will judge him harshly. . . .
We also need to remember how likely it seemed to Lincoln and others that he would lose the 1864 election, and thereby experience ignominious defeat and see the disintegration of the Union cause as he had fought for it. Had it not been for the miracle of Sherman’s and Grant’s decisive victories in the field, such a defeat at the polls would have been likely, as the American people had grown weary of this frustrating struggle. Where to start? Grant's and Sherman's victories in 1864 were not a "miracle." Both men's armies outnumbered the Confederates opposing them by 2 to 1, and they were superbly equipped with everything from rifles and cannons to teams of railway men who could repair track faster than Confederate raiders could tear it up. Neither Grant nor Sherman was a military genius. They were both competent, disciplined commanders hand-picked by Lincoln because they had the particular skill needed at the time, that is, they knew how to advance aggressively and to make superior numbers decide the outcome of a battle. They had those superior numbers partly because of Lincoln's skill in mobilizing public opinion and Congressional support behind the war. Lincoln took a personal role, not just in choosing generals, but in making sure that the railroads ran, that promising new technologies like repeating rifles and ironclad ships were pushed forward, and that black troops were used in the battle line. Yes, history is contingent. But it is rarely decided by "miracles," and great leaders like Lincoln actually have some impact on how it turns out.